The Magician calls upon the Universe and employs each of the elements to manifest his desires on this earthly plane. Each element symbolizes an aspect of life: air for thoughts and communication, fire for spirit and passion, water for emotions and relationships, and earth for money and health. The Magician uses his force of will and control to bridge the spirit and physical world. He uses each element appropriately. The Magician is the first card in the Major Arcana. He initiates the beginning of the journey through the deck. He uses his skills and tools for excellent communication, mature relationships, creative endeavors, and focused abundance. 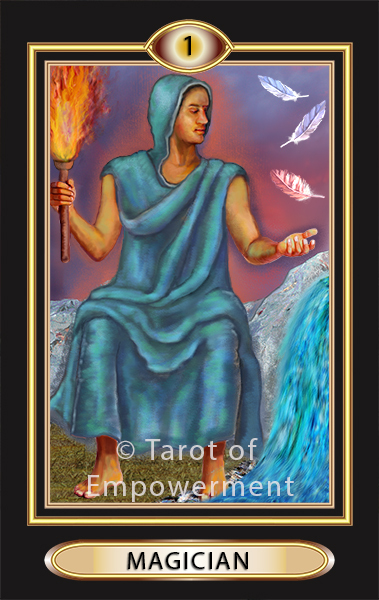 In Tarot of Empowerment, the Magician is attentive to his wishes and desires. He knows that the way he uses each element will be significant in what he is busy manifesting. He is creative, skilled, diplomatic and confident. He is respectful and gentle. Upright: When the Magician comes up in your reading you are being guided to believe that you can manifest your desires as long as you pay attention and work with the elements. Empowerment: As the Magician, know what it is you want, for you are empowered to call it to you. Focus your attention on what you want to manifest on this earthly plane. Understand you call on your magical powers doing harm to none. Reversed: In a reversed position, the Magician energy is within you, so you need to concentrate on manifesting internal changes. As a block, the Magician is warned to hold back from manifesting your desires until you review the purity of your motivations. Be aware of your own values and compare the ethics of what your want to do in light of those highest ethics. Remember, what energy you send out will come back to you three-fold. Numerology: The Magician is the number 1, representing the beginning of the projects and creative endeavors. Cards that reduce to 1 are the Wheel of Fortune (10) and the Sun (19).